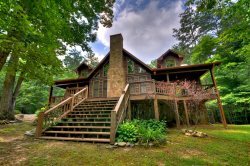 For nearly 20 years, Southern Comfort Cabin Rentals has offered privately owned, upscale cabins for rent in Blue Ridge and the North Georgia mountains. SCCR is the first choice in luxury cabin rentals, accommodation services, and property care in North Georgia. As a hospitality-driven property management company, we provide a full-service concierge team and flexible reservation options that make booking a vacation home easy and ensure a wonderful getaway. All of our North Georgia cabin rentals are located near Blue Ridge’s best experiences. We manage mountain cabins and lodge-style vacation homes in river, creek, lake, and forest settings. We also offer vacation rentals close to popular area activities including hiking and biking trails, whitewater rafting, horseback riding, winery tours, trout fishing, and scenic drives. Whether you choose a downtown loft apartment or a waterfront cabin along Lake Blue Ridge, you and your family are sure to enjoy your trip and fall in love with the beauty of the Blue Ridge Mountains. For many years, the Stam family has enjoyed vacationing in the North Georgia mountains. More than 20 years ago, they purchased two luxury cabins in the Mountain Tops community in Blue Ridge. Shortly after, they furnished and equipped the cabins to transform them into vacation rentals. As a result of their experience, they were inspired to connect friends and guests to vacation homeowners around the area, so they could share the joy of a Blue Ridge cabin vacation. Our company was founded by the Stam family to continue their mission of welcoming guests to Blue Ridge. We are committed to offering exceptional vacations and the highest value accommodations possible in the North Georgia mountains. CJ has more than 10 years of hospitality experience with a world-class hotel and resort management group. Having achieved many accolades and the distinction of being Employee of the Year at a leading executive business class hotel in north Atlanta, CJ understands the value of service. He has more than 15 years of rental property management experience after taking over managing his family’s real estate holdings from his father. CJ is an avid outdoor adventurer and first experienced Blue Ridge and the North Georgia mountains as a teenager fishing, rafting, hiking, and mountain biking. Heather has real estate sales, leasing, and management experience of both single-family homes and high-rise apartments in the metro Atlanta area. In addition, Heather is an accomplished decorator and has a natural flair for making things look beautiful and inviting as well as functional. She is well organized and disciplined in her approach to business and management. Understanding the value of service in hospitality and business, CJ and Heather draw on their many years of experience to ensure that each guest enjoys their stay in North Georgia and that homeowners are well served with management services from SCCR in Blue Ridge. Beatrice is a strong asset to SCCR. Originally from South Florida, she knew after one visit to North Georgia her family would move to Blue Ridge. And one year after that trip, her dream became reality! She previously worked for a real estate broker as Office Manager for 11 years handling the company listings and sales as well as several rental properties. This experience gave Beatrice first-hand knowledge of property management. With her extensive knowledge of day-to-day operations at SCCR, you can rest assured she will make sure your stay is a fun-filled adventure. As a host, her greatest enjoyment is sharing how wonderful Blue Ridge is and all the great things the area has to offer. She looks forward to helping you plan your unforgettable vacation to the North Georgia mountains. For more information, call 866.4CABINS or contact us online.